Deathrattle: Shuffle this minion into your deck. 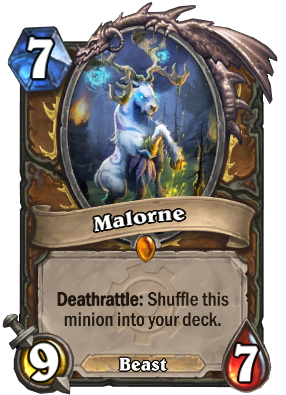 When Malorne isn't mauling hordes of demons, he enjoys attending parties, though he prefers to go stag. Is this card a keeper? Really need to craft Tirion Fordring. only beast that can talk ? Nope, Princess Huhuran and Kindly Grandmother. Though to be fair Kindly Grandmother being a beast is sorta stupid. The only reason I play Tomb Spider in my Beast Druid deck is so that I can play this card. How does Malorne interact with Spiritsinger Umbra? Will he go right back into the deck? Yes, he will go back to your deck, similar to Sherazin's "deathrattle-trigger" mechanic. well you could still use it for tavern brawls? those are usually wild, after all. I'm surprised this wasn't an 8/7. 9/7 for 7 mana is pretty good. I agree, 7 mana for 16 stat points is very solid. Doesn't beat a 4 mana 7/7 tho. who is better in ramp druid, this or Cenarius?